This Sunshine Solar Flexible Curve 150W 12V boasts ultra pure silicon delivering optimal power conversion. A solid copper foundation adds massive strength and prevents corrosion. Thin, light and when fitted to the roof of a caravan or motorhome very aerodynamic. Light weight design combined with high efficiency cells and solar panel flexibility makes our latest Solar Curve range also perfect for marine use and many more applications where a rigid framed solar panel is not an option. 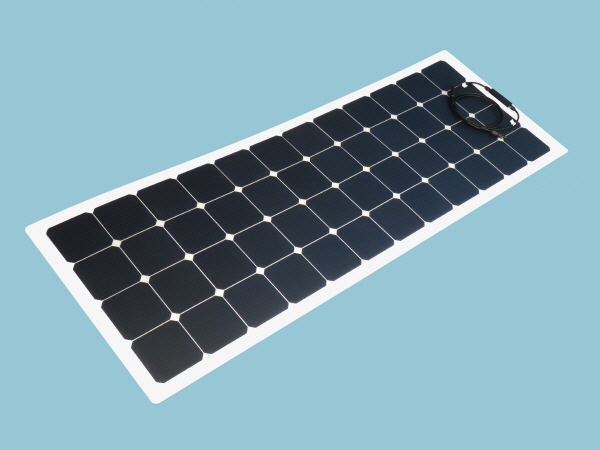 The Sunshine Flexible Curve 150W Solar Panels have been specially manufactured to provide a high DC voltage to maximise battery charging through a higher efficiency MPPT charge controller. If you are looking for maximum yield from your solar panel for 12 volt battery systems the 150W Flexible Curve 150W will provide the answer. With a Sunshine Curve 150W 12V solar panel you could expect to generate around 50 amps per day when used in conjunction with an MPPT Solar Controller during the summer months.